A theodolite for measuring both horizontal and vertical angles at once was an innovation described in surveying textbooks of the later 16th century, but apparently little used in practice. It was probably too complicated for general use and the functions it offered were not really needed. Thus, despite the enthusiasm and the confident claims of designers and authors, such instruments are very rare. 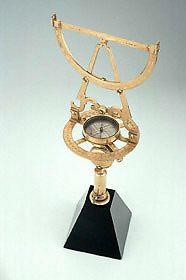 Neither does this somewhat delicate altazimuth theodolite in gilt brass look like an instrument that has seen much service in the field.